On 12 May 1866, in Castelnuovo, a small port at the southern tip of Dalmatia, a twelfth child was born to Peter and Caroline Mandic. He was named and baptized Bogdan, 'the God-given-one'. Although physically frail, from his youth he showed signs of great spiritual strength and integrity. At the age of 16 years, Bogdan left home for Italy where he put himself under the tuition of the Capuchins at Udine as a student in the Seraphic School and an aspirant for the Order. Life was not easy for him there, since he was physically malformed and still delicate in health. Nevertheless, he applied himself to his studies with great enthusiasm. On 20 April 1884, Bogdan entered the Capuchin Order as a novice at Bassano del Grappa and took the religious name of Brother Leopold. In spite of the austerities of Capuchin life, he persevered with courage and drank deeply of Franciscan Spirituality of which he was to become one of the finest models. After his Profession of Vows in May 1885, he embarked on a course of clerical studies first at Padua and then at Venice. Finally, he was ordained in Venice on 20 September 1890. Now wishing to fulfill a childhood ambition of becoming a missionary in Eastern Europe, torn apart by much religious strife, he was denied this by his superiors and because of his frailty and general ill health. This was assuredly a testing-time for the new Father Leopold, but God had other work for him to do. From 1890 to 1906, Father Leopold was stationed at various Friaries in the Venetian Province, including Friaries in his homeland of Dalmatia, where the Italian friars had a mission. In 1906, he was posted to Padua, where, except for one year, which he spent in a prison camp during World War I, because he would not renounce his Croat nationality, he remained for the rest of his life. It was in Padua that he took up the apostolate of Confessor and Spiritual Director... a work which proved to be the means through which God used his servant, Father Leopold, for almost forty years, and for which Leopold Mandic is best known. On 22 September 1940, Father Leopold celebrated his Golden Jubilee of the Priesthood. After this, however, his health deteriorated rapidly. He died in the Friary at Padua on 30 July 1942. Soon after his death, a strong veneration of his memory began to flourish culminating in his beatification by Pope Paul VI on 2 May 1976, and, his canonization by Pope John Paul II on 16 October 1983. 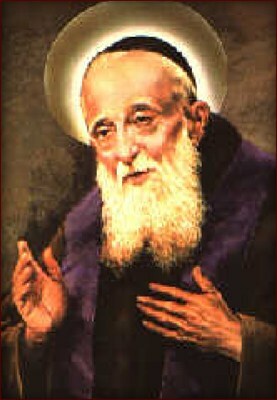 The life of Saint Leopold Mandic is characterized by the contrast between his physical frailty and his spiritual strength. He was born physically weak, and spent the whole of his life in that condition. He only reached 4ft 5ins in height and his general health became worse as he grew older. He suffered from abdominal pains, and was gradually deformed by chronic arthritis in later life, making his frame stooped and his hands gnarled, giving him much pain. He also suffered from a stammer in his speech. Spiritually, Leopold Mandic was a giant, full of Christian strength. It was his humility and faith in God's Goodness and Providence that enabled him to recognize and accept his poor physical condition. This in turn led him to a greater realization of his own lowliness in relation to God's mighty power - that without God he could do nothing. This strong faith was communicated to others when they came to Father Leopold for spiritual advice. He would say, "Have faith! Everything will be all right. Faith, Faith!" A compassionate man, Father Leopold gave tremendous encouragement to many people, especially those despairing of hope because of an enslavement to sin. He was truly an apostle. For although he did not go to the mission territory, his long service in the Confessional proved to be his own distinct apostolate. For nearly forty years, twelve hours a day, he received, counseled, and absolved thousands of penitents. In this work, he was a herald of God's love and forgiveness. His human weakness highlights the gift of spiritual strength which enabled him to carry out this untiring apostolate. Early in his Capuchin life, Leopold Mandic was asked to surrender his missionary aspirations and personal preference so as to be given the work of Confessor and Spiritual Advisor. He once expressed his feelings about this when he said, "I am like a bird in a cage, but my heart is beyond the seas." A Lesson Saint Leopold has much to teach us. He is an inspiration for us to be humble and strong in the Christian faith we have received from God. He is, moreover, a living memorial of that truth preached by the Apostle Paul to the Corinthians: "It was... to shame the strong that He chose what is weak by human reckoning." His ministry of God's forgiveness in the Confessional can teach us of the real value and importance of the Sacrament of Reconciliation, whereby we rise from the death of sin to the fullness of life in Christ. Saint Leopold is definitely a man for us and for our time.